Nebraskon is in less than two weeks so with permission I made this "behind the scenes" video of their commercial with footage that Denny took. I only spent an hour on it but it looks good. I even added rain and lightning to their logo. It is amazing how far the droids have come in two months. I was not happy with the press board versions of the ankle brackets that I had for my legs so I decided to make new ones out of some spare styrene. First I traced around the old broken ones. After cutting them out I cleaned up the edges. Once that was done i silvered them on both sides. Put two coats of paint on Patches' boosters finally after almost two years. I also painted the front part of the rear power coupler. I will let them cure for a week or so before putting them on. We had fun at Pumpkin carving night. All sorts of different pumpkins were carved. Start of an Imperial Cog. Other Pumpkins were started as well but not finished in time. I will post them later. Do not know if anyone noticed from one event to the other but if you look you can no longer see Patches mounting screws for his skins. 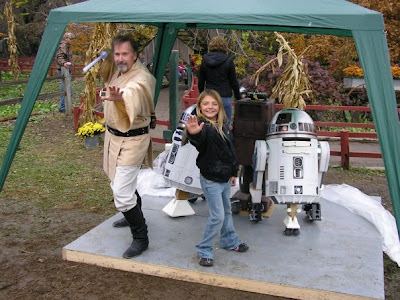 They are now whited out and do not show up in regular pictures just like the real R2s. 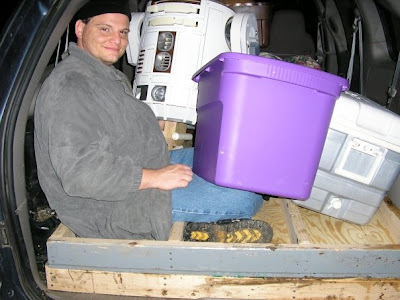 Brad's R2 and Patches got to go onstage for a Concert here in omaha that had Star Wars music in it. The 501st and us entertained the crowds before the show. Young and old alike were ready to have fun. Lumpy and Patches getting cleaned up before the show in their dressing room. They are now nice and shiny after being at Vala's the day before. The band starts up and that is our sign to head out to the stage. Vader takes over as conductor. Here is a small video of our part of the event. 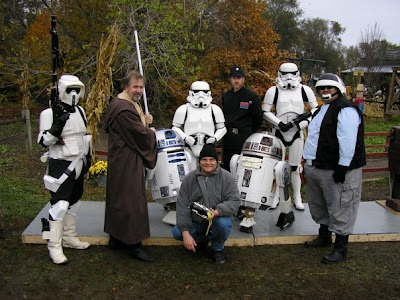 Another year at Vala's with the 501st. Always a fun event. Most of the day was warm and sunny and we had fun with the crowds of people and friends. 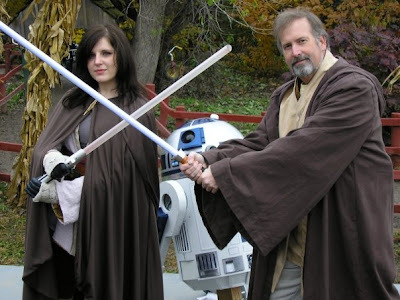 Two Jedi, champions of the force. R2 is in awe. When we needed to take a break we had a bon fire in the back with food and drink. Here is a group photo with just some of the troopers that were there that day. Here Brad's R2 is sporting his new skins that used to be on my R4-ED. 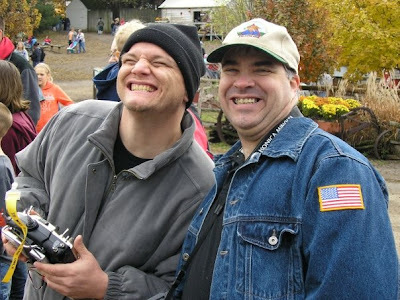 R2 and patches turn to face the camera while sharing a joke with each other. After a few hours it started to rain so 501st memberJohn lent us his canopy. Even with the rain the people kept coming up for pictures. 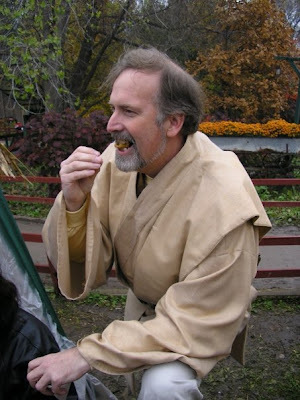 A Jedi being tempted by the dark side....they have cookies. Dawmer was nice enough to help out with bringing the dance floor back and forth to the event. Here I am all wet, muddy, cramp, and tired after we got home. Well worth it though, had a lot of fun. Not enough time to finish everything I wanted to do but Patches is back together for now. During the build night Brad and I helped Syrena get her R5 legs mounted to her frame. Once Syrena finished sanding the frame flush we temporarily mounted the skins to locate the position of the pipe holes. Once the location for the holes were marked and I was sure they were in the same location on both sides I drilled the holes while Brad and Syrena held the frame level and still. Next Brad cut the pipes the the right size while we held them still. Tada! The outer legs are on. Next after we marked some angle iron for the inner frame Brad cut the pieces while we held them still. Brad then welded most of the pieces together before we called it a night. Yet another droid for the army is well on the way to standing tall.